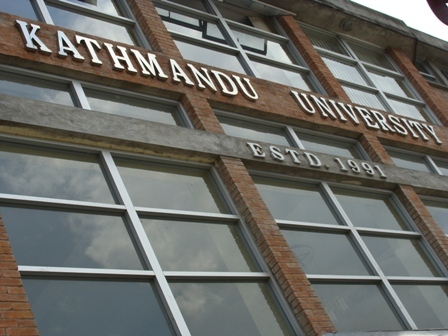 Main Administrative Building of Kathmandu University, Dhulikhel. Since there was no networking and very rare interaction among the students of media and journalism & mass communication, so we have come up with a concept to bring all the students of the same discipline . An inter-collage media students meet. Organizer: Media Studies Group (MSG), Kathmandu University. Date of Event: 2010 June 6th; Sunday. Location: Kathmandu University CV Raman Auditorium. Dhulikhel, Kavre. 15. White House Colleg: New Baneshwor (On the way to Old Baneshwor). 1)	Network: This event will help all the media students establish a network among them and create an environment of mutual sharing. 2)	Platform: The participants can use this platform to represent their college in national arena. Target Audience: Media academicians, Media professionals, Intermediate and Bachelor students who are studying mass communication and journalism in collages of Kathmandu Valley and Kavre district. The numbers of colleges are increasing as ever in Kathmandu valley, including that of Journalism & mass communication. Bearing this fact in mind ‘SAHAYATRA’ is going to be organized by MSG, Kathmandu University on June 6th, 2010. This will be a grand platform for students to meet their contemporaries as well as get the benefit of interacting industry stalwarts and media academicians and developing relations with them. Students’ attraction and interest toward education in mass communication and journalism is always an increasing trend. Every year lots of students get enrolled in different colleges affiliated to Tribhuvan University Board, Purvanchal University Board, Kathmandu University Board and Higher Secondary Education Board (HSEB) to study Mass Communication and Journalism. The present situation reveals that students who are pursuing their education in the mass communication field are not aware about the strength and space for improvement in the academic and professional field of the same discipline. Realizing the importance of a network, that should have been established much earlier, MSG shows its eagerness to take the first step towards this venture. We are sure that the event will be very fruitful for all the participants through various activities. In the event we will invite experts from Print, Broadcast (TV+Radio), and related industries like Film, Advertising to speak at the program. Also, the dignitaries from within the university and department will address the program. This section will be held on the 3rd of June, 2010. Only one representative from each college will be participating in this discussion which will take place in Kathmandu Valley (the exact location and time will be informed later). This discussion program will fix the agendas and plan of actions for the networking among different colleges. Since it takes long time for discussion regarding network, we have planned to sort it out few days earlier. Furthermore, it also helps us to get feedback regarding the event. Any one interested in participating in the upcoming photo competition, please read the conditions below. 1. The participants of SAHAYATRA are eligible for the photo competition. 2. The theme is “———————————————————————–”. 3. You can submit up to 3 photos. Among all the available photos only best 25 will be placed on exhibition and out of them three photos will be prized. 4. Photos can be in black and white or colored, must be digital and must be taken by the participant. 6. Works are to be submitted as digital files to kumsg.info@gmail.com & amolsansar@gmail.com (Email address). 7. All photos are to be submitted at size no smaller than (8*10) inches with high resolution. 8. Please include your name and a brief caption for the photo with your submission. 10. The deadline for accepting entries is 3rd June 2010. 11. The winners (1st, 2nd and 3rd) will be judged by a photo expert. There is some problem with above information which will be sort out as fast as we can. i am the student who have given the slc exam. so i want the best collage for giving entrance.hope you will provide me one chance. Dear Gaurav ji, hope you will find a good college. im an a level student who have attained exam on oct/nov 2010 from trinity clollege (dilliibazar)and waiting for her a levels results. Theirs rumor, result will be published in 2nd or 3rd week of january.Im super excited about my further education on media studies but according to the information displayed the form submittion date is already over.So, it would be very graceful if you provide some help about what i should do in order to get admitted in ku.